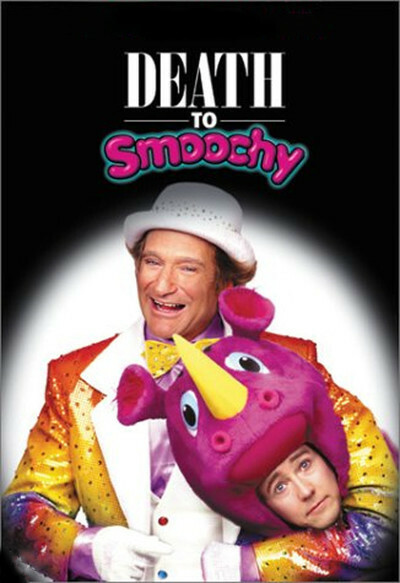 Only enormously talented people could have made "Death to Smoochy." Those with lesser gifts would have lacked the nerve to make a film so bad, so miscalculated, so lacking any connection with any possible audience. To make a film this awful, you have to have enormous ambition and confidence, and dream big dreams. The movie, directed by Danny DeVito (! ), is about two clowns. That violates a cardinal rule of modern mass entertainment, which is that everyone hates clowns almost as much as they hate mimes. ("Big Fat Liar," a much better recent showbiz comedy, got this right. When the clown arrives at a birthday party, the kids joyfully shouts, "Hey, it's the clown! Let's hurt him!") Most clowns are simply tiresome (I exempt Bozo). There are however two dread categories of clowns: clowns who are secretly vile and evil, and clowns who are guileless and good. "Death to Smoochy" takes no half-measures and provides us with one of each. We begin with Rainbow Randolph, played by Robin Williams, an actor who should never, ever, play a clown of any description, because the role writes a license for him to indulge in those very mannerisms he should be striving to purge from his repertory. Rainbow is a corrupt drunk who takes bribes to put kids on his show. The show itself is what kiddie TV would look like if kids wanted to see an Ann Miller musical starring midgets. The good clown is Smoochy (Edward Norton), a soul so cheerful, earnest, honest and uncomplicated, you want to slap him and bring him back to his senses. Sample helpful Smoochy song for kids: "My Stepdad's Not Bad, He's Just Adjusting." Both of these clowns wear the kinds of costumes seen at the openings of used car lots in states that doubt the possibility of evolution. Rainbow is convoluted, but Smoochy is so boring that the film explains why, on a long bus ride, you should always choose to sit next to Mrs. Robinson, for example, rather than Benjamin. Enter the film's most engaging character, a TV producer named Nora (Catherine Keener), who, like Rachel Griffiths, cannot play dumb and is smart enough never to try. She's taking instructions from the network boss (Jon Stewart, who might have been more interesting as one of the clowns). They're trapped in an inane subplot involving two bad guys, Burke (DeVito) and Merv Green (played by the gravel-voiced Harvey Fierstein, who, as he puts on weight, is becoming boulder-voiced). There is also Vincent Schiavelli as a former child star, now a crackhead. The drama of the two clowns and their battle for the time slot is complicated by Rainbow Randolph's attempts to smear Smoochy by tricking him into appearing at a neo-Nazi rally. One wonders idly: Are there enough neo-Nazis to fill a thundering convention center? Do they usually book clowns? The answer to the second question may be yes. The movie ends by crossing an ice show with elements of "The Manchurian Candidate." It involves an odd sexual predilection: Keener has a fetish for kiddie show hosts. It has a lesbian hit-squad leader with a thick Irish brogue. It uses four-letter language as if being paid by the word. In all the annals of the movies, few films have been this odd, inexplicable and unpleasant.